Its not very often that you find Seasonal Chef writing about desserts. Truth be told, I’m just not that excited about baking. When pushed I can create some really beautiful sweet dishes, but it’s not my passion. That said, every now and then I get really excited about an interesting ingredient which spurs me on to create something delicious. Case in point: the persimmon. 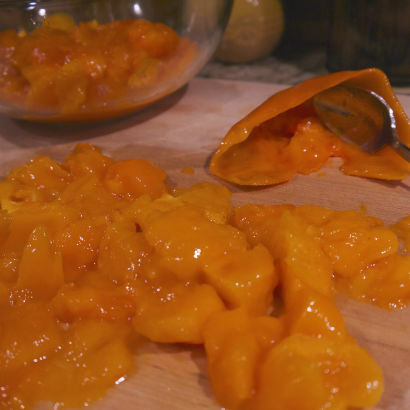 Persimmons are in season right now and make a lovely dessert for the holidays or your next dinner party. There are two varieties readily found: the hachiya (pronounced HA-she-ya) and the fuyu (pronounced fah-YOU). Of the two varieties the hachiya is best for baking. Generally when I decided to write about an ingredient it’s because something grabs hold of me, an inspiration if you will. I start researching my cookbooks, magazines and of course, pouring over on line blogs and stories. That is what happened a few weeks ago. On a recent trip to Italy while touring a beautiful vineyard in Friuli I spotted a tree in the distance. 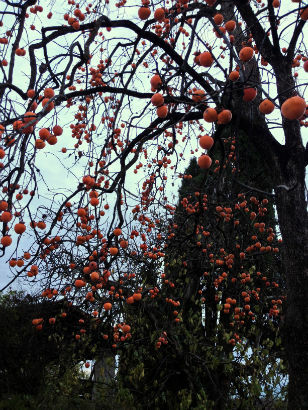 Against the cloudy sky it looked like oranges hanging from a leafless tree. When we got closer I realized they were persimmons. It was so dramatic and beautiful and not something you typically find in our area. At dinner that night at Orsone one of the courses served to us had persimmons incorporated into the dish. 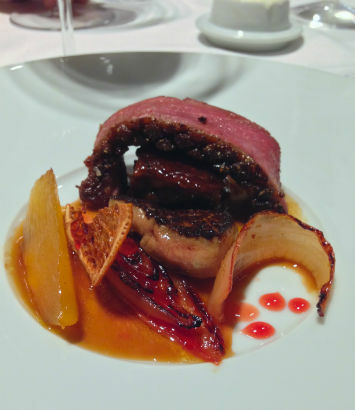 It was Duck Three Ways with Persimmon and Grilled Endive. Quite magnificent. When we got home from the trip after Thanksgiving I started seeing persimmons everywhere: Whole Foods, Stop and Shop, Apple Farm. I suppose they were calling to me; but what exactly are they? They are a fruit that has been cultivated for nearly 2,000 years. Marco Polo is credited with bringing it westward in the 13th century. It’s genus name is dyospyros, which means fruit of the gods, in Greek. 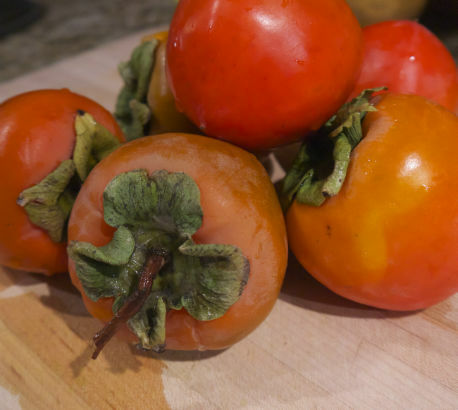 Persimmons are high in Vitamin C and Potassium with little or no fat, cholesterol and sodium. 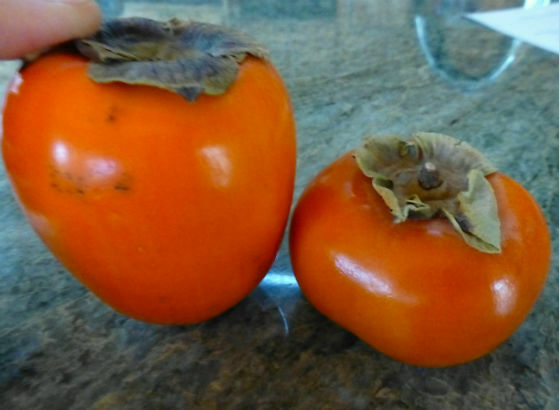 There are basically to types of persimmon, as I mentioned above. The smaller squat variety is called fuyu, and it should be eaten when firm. The second type, and the one for this recipe, is hachiya. That variety needs to be fully ripened and very soft. Otherwise the fruit has a dry astringent pasty taste. 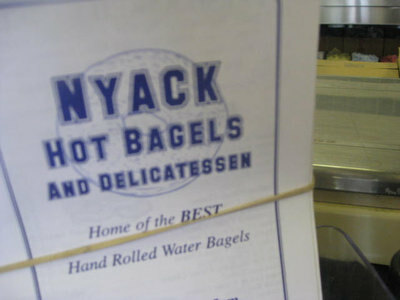 Definitely not good eats. You want to look for a smooth unbroken skin. The hachiya should have a heaviness to it when you hold it in your hand and be quite soft. Almost to the point that if you gave it a good squeeze it would burst and ooze. After a rinse in cool water cut off the top and scoop the flesh onto your cutting board. If you have any larger pieces just chop them up. 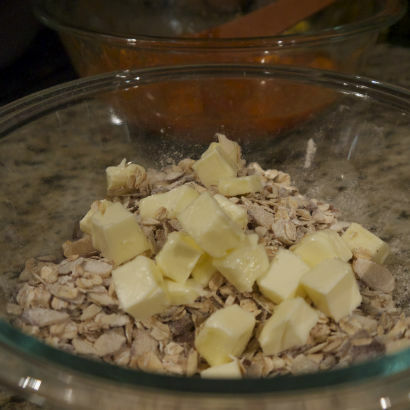 The topping is a mixture of rolled oats and almonds. 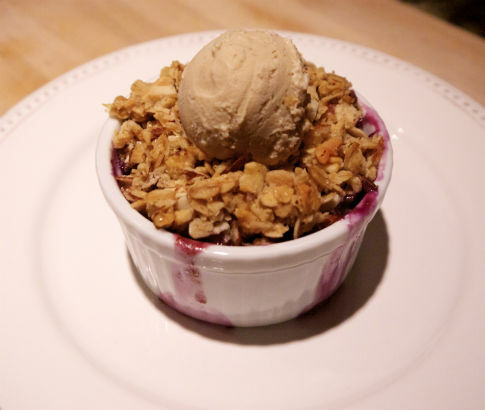 Speaking of toppings, have you ever wondered what the difference between a crisp, cobbler and crumble? 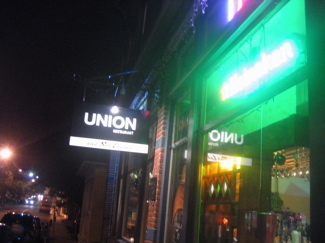 I found this great link: that describes the differences between each of them. For my recipe I have a “crisp” topping. This is one of those times were you need to get into the bowl with your fingers. Food processors are great for cutting in the butter for a crust, but in this case you really want to work in the butter by hand. If your butter is at room temperature it’s an easy task, taking only a few minutes. This is a great do-ahead dessert. Simply make the filling and the topping and keep them separate the ‘fridge until ready to bake. 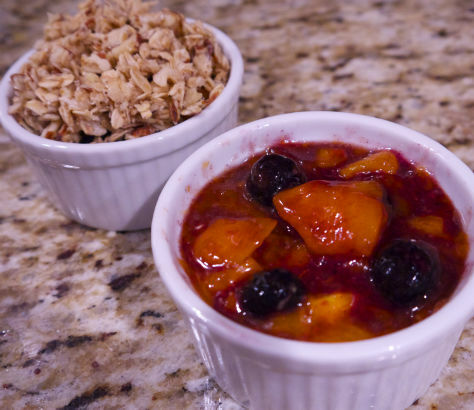 Click here: to see my Persimmon Crisp recipe. This dish is perfect on it’s own, or topped with a little scoop of gelato. Vanilla is always a perfect combination with a warm dessert, but if you can find a cinnamon gelato or ice cream use that. The flavor will play off the filling in a most delicious way.